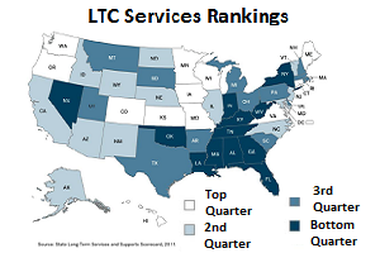 If you're selling to consumers in Florida, Nevada or New York, they might need private long-term care insurance (LTCI) more than prospects living in Hawaii, Kansas or Connecticut. If you’re selling to consumers in Florida, Nevada or New York, they might need private long-term care insurance (LTCI) more than prospects living in Hawaii, Kansas or Connecticut. Researchers at the AARP Public Policy Institute, Washington, tell the tale in a “long-term services and supports” state scorecard they created together with the SCAN Foundation, Long Beach, Calif., and the Commonwealth Fund, New York.